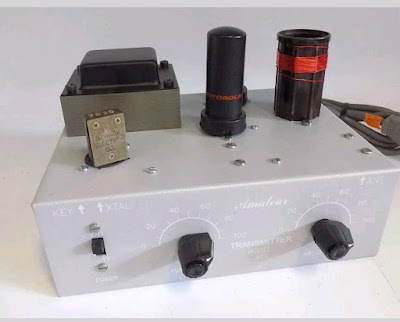 The Ameco AC-1 was a popular first transmitter kit for amateur radio novices in the 50s. I heard the AC-1 mentioned on several QSO Today podcasts from hams who are my senior. I am infected with the nostalgia of those times. I acquired an assembled AC-1 clone from eBay at a reasonable price. 15 watt 80/40 meter transmitter using 6v6 oscillator on "shoebox" style chassis. Xtal control. I tried the AC-1 into a dummy load and could not get any RF power out. This was a mystery as the seller showed the rig putting five watts into a dummy load. Thinking it could be operator error, I kept trying. I consulted with Tom WD0HBR. He inspected it and gave me some checks to do. The B+ and filament voltage was good. I read online you can use a milliamp meter in the key circuit as a tuning aid. At least, with the milliamp meter, I saw something to dip. It tuned up fine a couple of times. However, when I wanted to put it on the air, I could get little output. This was definitely harder than it should be. With some checking of the output circuit, I found the antenna loading capacitor shorts when the plates start to mesh. This could explain the tuning issue. I will look into obtaining a replacement capacitor. It is true that you learn more radios when they don't work. I have a vision of using the Ameco AC-1 with my SDRPlay RSP-2 Software Defined Radio. This would be a nice combination of old technology and new technology. We will look forward to that when I get the AC-1 going.